Short Ropes - Website of victoriamountz! Freshwater pearls, jade, crystal and glass beads were strategically strung on/and knitted with bronze coated copper wire to make this necklace. Two French knitting techniques were combined in this design. It measures 20 1/2" and extends to 22 1/2" long and alternates 3/8" and 1/2" in thickness. Coordinating earrings and bracelet may be available. Price Includes Sales Tax. 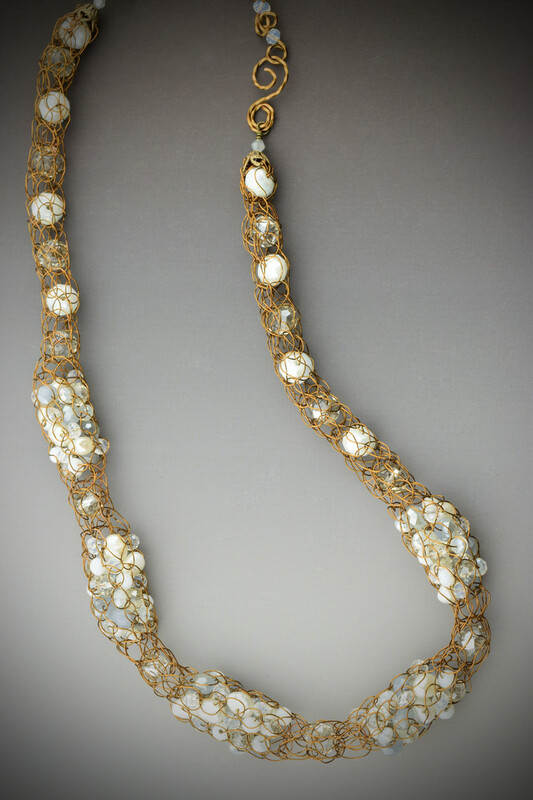 Freshwater pearls, turquoise, and glass crystal beads were strategically strung on/and knitted with bronze coated copper wire to make this necklace. Two French knitting techniques were combined in this design. It measures 20 1/2" and extends to 22 1/2" long and alternates 3/8" and 1/2" in thickness. Coordinating earrings and bracelet may be available. Price Includes Sales Tax. Freshwater pearls, crystal and glass beads were strategically strung on/and knitted with bronze coated copper wire to make this necklace. Two French knitting techniques were combined in this design. It measures 20 1/2" and extends to 22 1/2" long and alternates 3/8" and 1/2" in thickness. Coordinating earrings and bracelet may be available. Price Includes Sales Tax. 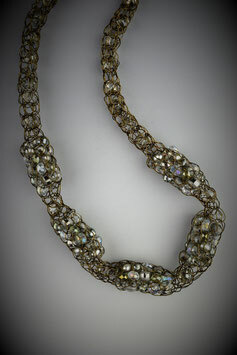 Freshwater pearls, gemstones and glass crystal beads were strategically strung on/and knitted with bronze coated copper wire to make this necklace. 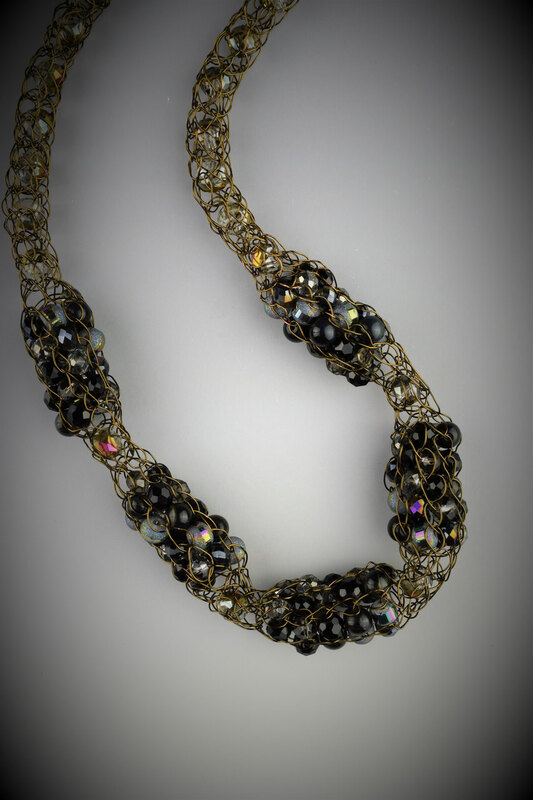 Two French knitting techniques were combined in this design. It measures 20 1/2" and extends to 22 1/2" long and alternates 3/8" and 1/2" in thickness. Coordinating earrings and bracelet may be available. Price Includes Sales Tax. 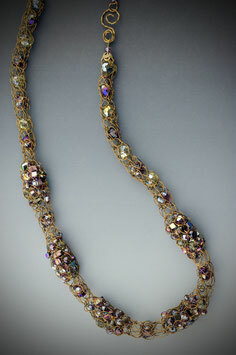 Garnets, freshwater pearls, crystal and glass beads were strategically strung on/and knitted with bronze coated copper wire to make this necklace. Two French knitting techniques were combined in this design. It measures 20 1/2" and extends to 22 1/2" long and alternates 3/8" and 1/2" in thickness. Coordinating earrings and bracelet may be available. Price Includes Sales Tax.